Special 50% Off Early Bird Ticket Offer to see ICE! The Nutcracker at Gaylord! 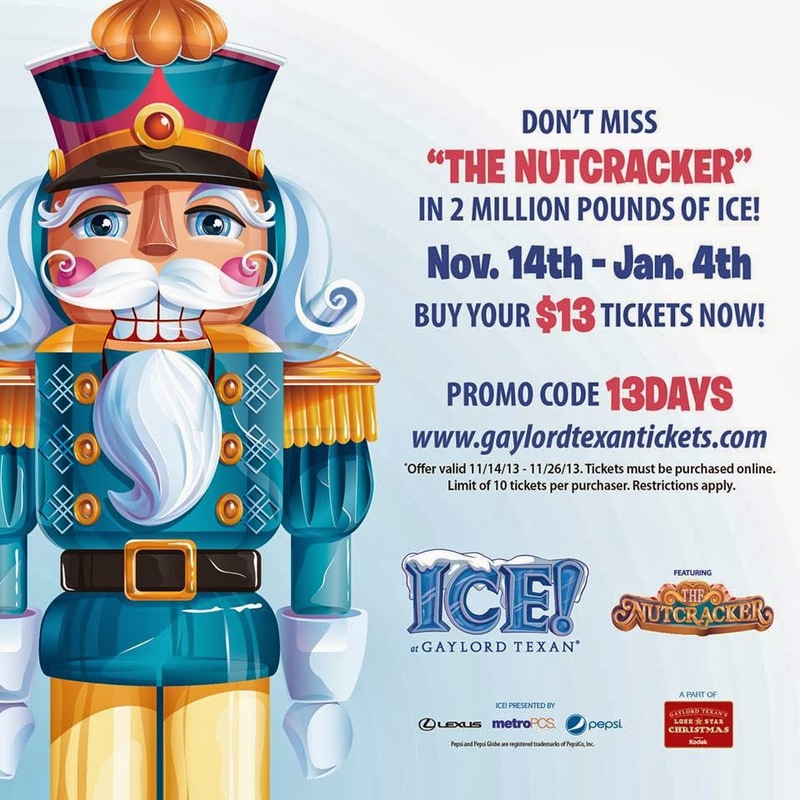 This year the Gaylord Texan will play host to the ICE! featuring The Nutcracker. I am so excited to return to see this exhibition of over 2 million pounds of ice carved into magnificient pieces of glistening fun. It is truly something to behold and my kids love it every year! Your probably wondering if I am just way to excited for the holidays or if I have just lost my mind by already talking about an event that doesn’t even start until November 14th. Well, I am ready for fall and all the holiday excitement but there is really a reason why I am talking about this now and it has everything to do with taking advantage of a GREAT DEAL to see ICE! The Nutcracker!! Now through October 13th, you can purchase your tickets and pay just $13 for admission valid during the first 13 days of the exhibit (11/14 – 11/26) with Promo Code: 13DAYS! That is a savings of over 55%. Just click HERE to make your ticket purchase. ~ Children ages 0-3 are FREE but will need a ticket. View peak and non-peak day schedule HERE. Previous postChili’s FREE Appetizer or Dessert Coupon Valid 9/25 – 9/26! Next postState Fair of Texas FREE Blue Bell Ice Cream/ Dr. Pepper Floats on Wednesdays!